This Rumble ended on 2002-12-01 00:00:00.0. Favorite Quote: "It is the One God who commands it." As a Child: A serious and devote child who prayed to whatever gods would listen. Rescued by Goldmoon she considered her her adoptive mother. Hears Voices: As a child her family was lost at sea, but she heard the "voice" of the One God that saved her alone. The One God speaks to her often. Second in Command: A rough and gruff minotaur, that at first treated her with scant respect, but grew to love her, despite the fact she was human. Presence: A certain elf who knew her declared that there was something about her which beckoned every unseemly thought in his head. Leadership: Lead great armies that routed the Solamnics from Ergoth. Favorite Quote: "It is God who commands it." As a Child: A pious child, grave beyond her years, who often knelt in the church absorbed in prayer, and loved the poor tenderly. Hears Voices: As a teenager she becomes conscious of her "voices" or her "counsel." It was at first simply a voice, as if someone had spoken quite close to her. Second in Command: A rude and dissolute soldier, that at first treated her and her mission with scant respect, but grew to respect her. Presence: All who knew her declared that there was something about her which repressed every unseemly thought in her regard. Leadership: Lead great armies that routed the English from France. Kipper: Hullo Joan of Arc, so what has brought you here today? Joan: I was sent by Saint Michael. He has informed me that I have come here today to denounce a false god. And to prove the holy might of my Lord. Kipper: I see. How to you plan to win today? 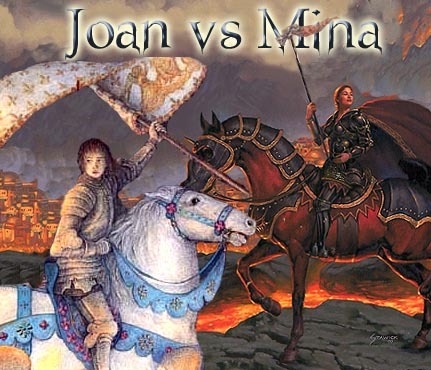 Joan: Through the grace of God I shall prevail in this forthcoming battle... and the fact that I carry a bigger flag. Joan: Do you not believe in the power and strength of God? He shall provide! Kipper: OK... if you say so..
Kipper: So Mina I suppose it was the One God that asked you to be here today? Kipper: And the "ONE GOD" asked you to be here?! Mina: Oh, Yes. I have heard the call of the One God and I have come forth on behalf of the One God. Kipper: Good, so how to you plan to win today? Mina: It is the will of the One God that I triumph in the conflict and for that simple fact I will be declared the winner. Mina: The One God does not require such an obnoxiously large banner! Everything will be made clear once the battle has begun! Kipper: Ok. Let the battle being!